The Fort William Henry Museum and Restoration and the French and Indian War Society are sponsoring a reenactment this weekend. 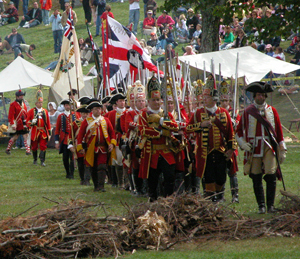 Reenactors from throughout the Northeast region will be coming to the Lake George to take part in the activities. Most of the events are free and open to the public. The exception is the 18th Century Colonial Dinner/Dance on Saturday night, which is $15 per person. Most of the camps will be set up at Battlefield Park, as well as on the grounds of the Fort William Henry Hotel and Conference Center. Battle reenactments will take place at 2:00 pm on Saturday and Sunday. Drills and skirmishes will take place at 11:00 am on both of those days. Fort William Henry was built by the British during the French and Indian War (1754-1763) as an outpost to secure its colonies’ northern border against the French. In 1757, French forces under the Marquis de Montcalm moved south from their base at Fort Carillon (Ticonderoga) and lay siege to the fort. After six days of fighting, during which the fort’s cannons and mortar burst from overuse, and with little chance of reinforcements from Fort Edward, Lt. Col Monro was forced to surrender to Montcalm. The Fort William Henry Museum and Restoration is located at 48 Canada Street, Lake George, New York. For additional information, please call 518-964-6626.